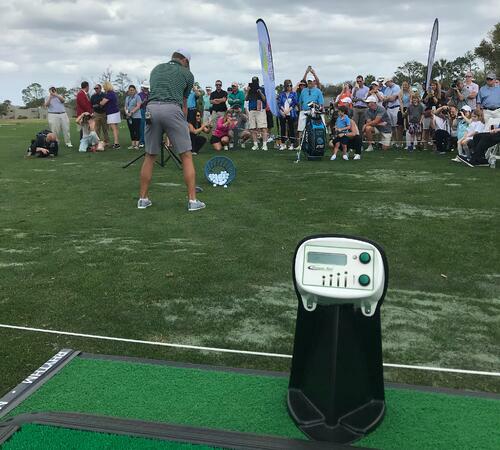 The driving station at the All Star Kids Clinic, with everyone loving Power Tee! We've talked about the Tesori Family Foundation and the awesome work they do before, but if you need a refresher - Paul Tesori is Webb Simpson's caddie - the 2018 winner of THE PLAYERS Championship. He and his wife started a foundation to help children with Down syndrome, having been touched by it through their son, Isaiah (and his extra special extra chromosome, as they call it!) and have helped children across the country since founding in 2009. For the past few years during TPC week, the Tesori Family Foundation has hosted a golf clinic for kids with Down syndrome, inviting coaches like PGA Tour Champion Jordan Speith, whose sister is special needs as well, to help the kids learn to golf and have a fun-filled day. Jordan Speith demonstrating for the kids! Jordan Speith wasn't the only star coach! Josh Scobee, former Jacksonville Jaguars kicker and scratch golfer, brought his son and was also a coach, along with a few other PGA Tour players. Jimmy Roberts from NBC Sports came too, and was the announcer for the first part of the day. This was Power Tee's 3rd year volunteering at the clinic, and this year we brought two Power Tee units on our demo trailer to help the kids with their super cool driving skills. The result: they did AWESOME!!!! It was really wonderful to see the kids, their parents, all the volunteers, and the coaches smiling and having fun hitting some golf balls in the sun. Golfing with Jordan Speith as your coach, getting a bag full of goodies, AND having a pizza party?! It's official. Yesterday was the best day ever. Nothing can top it - at least until next year's All Star Kids Clinic!